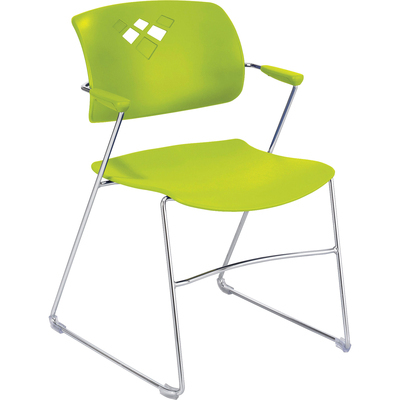 SAF4286GS : Safco® Safco Veer Flex Back Stack Chair With Arm - Grass Green Seat - Grass Green - 17.75" Seat Width X 17. Safco Veer Flex Back Stack Chair With Arm - Grass Green Seat - Grass Green - 17.75" Seat Width X 17. Flex Back Chair With Arms Features A Back That Arches With Your Body'S Natural Curves To Provide Relaxing Support. Stack Chairs Up To Nine High On The Floor And 28 High On A Cart. Chair Includes Nonmarring Floor Glides To Protect Floors..
Flex Back Chair With Arms Features A Back That Arches With Your Body'S Natural Curves To Provide Relaxing Support. Stack Chairs Up To Nine High On The Floor And 28 High On A Cart. Chair Includes Nonmarring Floor Glides To Protect Floors.